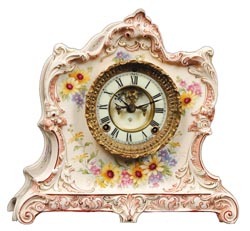 Ansonia Clock Co., Royal Bonn, "LaLorne", ca 1901. Another case primarily a basic white, the next major color is pink, some gold striping, and flowers from yellows to violet. Case is 11.5" high, 12.25" wide. Ly-Ansonia, page 620.